Executive producer Tom Blair is nearly finished with the audio post-production phase of this year's DVDs. All 24 Division I corps will be available with 5.1 digital surround audio on DVD. 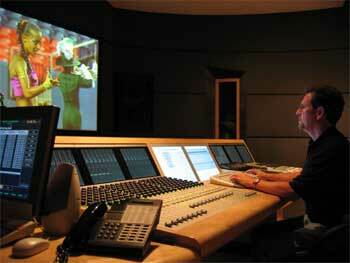 Tom Blair putting the finishing touches on the Santa Clara Vanguard's 5.1 digital surround mix. "We just have a few final tweaks to make on the mixes of all the corps," said Blair. "This weekend, I took test disks out of the studio and listened on several different consumer surround systems, just to be sure that the balance was good on all types of systems." Once the audio is completed, next comes the authoring and operational programming of the DVDs. "These aren't the typical DVDs folks can make at home. With the multiangle and multiaudio content, there's quite a bit of juggling to get the maximum audio and video quality versus the amount of content and functionality," said Blair. "My DVD engineer Casey Mershon is a technical genius with this stuff. With disks that are as complicated as DCI's, there are plenty of traps and dead ends. It takes the concerted effort of a great team to make these disks sing." The final step in the process is the disk manufacturing. "We make DVD-9s for DCI. That means they have a nine-gigabyte capacity," comments Blair. DVD-9s are two-layered discs which have to be molded, not burned. They have to be replicated by a DVD manufacturer. "We send the content to the manufacturer on DLT tapes, and they make test disks. We then evaluate, double and triple check the test disks and once we sign off on the test disks, they mold the final product." The art is then printed on the disks, the inserts and outer art is printed and then all the elements are packaged and shipped. "Then," adds Blair, "The fans dim the lights, turn the amps to 11 and hope the artwork stays hanging on the walls."